Every hour Sinead Miller spends figuring out how to cure sepsis equates to some untold amount of time she’ll spend in a cool, dark, quiet room, her brain recovering from punishing migraines triggered by bright laboratories and computer screens. Miller, 27, was a pro cyclist at the top of her game, a lifelong athlete with unrivaled discipline and drive, when a collision and resulting traumatic brain injury ended her career. She drew upon that determination to earn a biomedical engineering Ph.D. and launch her company, PATH EX, out of Vanderbilt University. She’s ready to produce and market a blood test that aids in diagnosing sepsis in seconds as opposed to hours of lab time spent waiting for a culture to grow. She’s also raising capital through a Memphis business accelerator and multiple pitch competitions to advance PATH EX’s major offering: a device that clears bacteria from the blood through a process that resembles kidney dialysis. Sepsis occurs when the immune system, already fighting one infection, malfunctions and causes bacteria to inflame the entire body. It’s a leading cause of death in intensive care units — nearly half of all ICU patients who get it die— and it costs the U.S. healthcare system $24 billion annually to fight. Compelling figures, but ones foreign to Miller until well after she arrived at Vanderbilt. She grew up in Pittsburgh, Pennsylvania, the daughter of famed Superbike motorcyclist Rex Miller. She was in competitive BMX racing by age 4 and turned pro at 15. She picked up road cycling at 9 and soon knew she’d found her true passion. She did that, week after week, race after race. An article in her hometown paper charts her high school career, revealing that she often raced against adult men so she’d feel stronger in women’s races. Her parents debated whether she should turn pro right away or go to college. 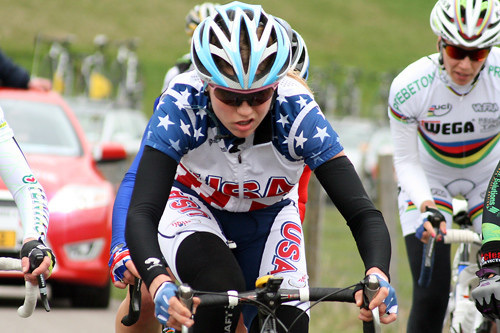 Miller accepted a full cycling scholarship to Marian University in Indiana, quickly taking both the collegiate track and collegiate road criterium national championships. She joined the U.S. National Team in 2008 at 18, competing in races around the globe and setting her sights on the 2012 Olympic Games. Her cycling record starts out shaky in 2010 but shows she hit her stride by late spring, collecting a series of first-place wins. The streak ends with Italy in July. Next up was Holland, a three-stage race of 130K per day, starting Aug. 31. On day two, Miller was in the front breakaway with 10K left, tapping her last bit of energy to get to the lead. People tell her she hit a parked car. She can’t remember. She returned to Pittsburgh for treatment. It took two years before she recovered enough to end outpatient visits and go back to school, earning her bachelor’s in biomedical engineering from Indiana University—Purdue University Indianapolis. I really miss it. As soon as I’m better, I want to come back. That hasn’t happened. With fatigue a major issue, it’s tough for her to do any exercise. She sees a neurologist who is tracking a brain lesion. Migraine headaches are routine, triggered by loud noise, computer screens or bright lights. Miller has experienced pain every day since the accident, but she’s learned techniques to manage it that allow her to do research. 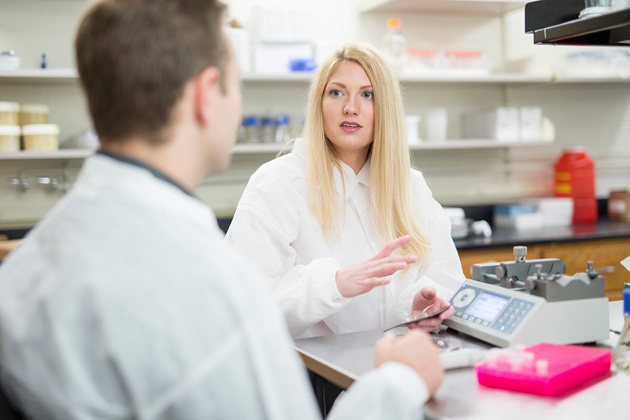 She chose Vanderbilt in 2014 for her Ph.D. because she wanted to work with Professor of Biomedical Engineering Todd Giorgio. Giorgio said he knew from their first meeting that Miller had the curiosity and focus to be successful. Miller earned that Ph.D. in three years, her research beginning with using magnetic nanoparticles to bind to bacteria and pull it out of blood. It worked in small quantities, but countless computer models showed it was scalable to clinical use. There just wasn’t enough force. She picked sepsis specifically because of available Department of Defense funding to address the problem of soldiers returning from Iraq and Afghanistan with drug-resistant bacteria. The military wants a treatment not dependent on antibiotics. If proven to work, Miller’s device has great potential to help those patients and many others, said Dr. Julia Lewis, a nephrologist in the Vanderbilt Center for Kidney Disease who Miller consulted. The PATH EX device consists of a hollow channel that uses centrifugal forces to separate sepsis from the blood, and then cleaned blood is pumped back into the patient. Miller has filed for provisional patents and is working with the Vanderbilt Center for Technology Transfer and Commercialization on intellectual property issues and Food and Drug Administration approval. Her advisers at the Wond’ry are helping perfect a business plan and a pitch to investors. That side of entrepreneurship comes a little less naturally, Miller said.